The Native American story of Metacomet. Learn about the culture, stories, myths and legends of American Indians and their famous chiefs and tribes. A Native American Story of Metacomet to teach kids about Native Indians in a short, enjoyable, easy to read format. While in Virginia the white colonists were hard put to it by the Powatans, the good ship Mayflower had landed the Puritan Pilgrim Fathers on the Massachusetts Bay shore to the north, among the Pokanokets. The Po-kan-o-kets formed another league, like the league of the Powatans. There were nine tribes, holding a section of southeastern Massachusetts and of water-broken eastern Rhode Island. The renowned Massasoit of the Warn-pa-no-ag tribe was the grand sachem. In Rhode Island, on the east shore of upper Narragansett Bay was the royal seat of Montaup, or Mount Hope, at the village Pokanoket. Great was the sachem Mas-sa-so-it, who ruled mildly but firmly, and was to his people a father as well as a chief. Of his children, two sons were named Wamsutta and Metacomet. They were renamed, in English, Alexander and Philip, by the governor of this colony of Plymouth. Alexander was the elder. He had married Wetamoo, who was the young squaw sachem of the neighboring village of Pocasset, to the east. Philip married her sister, Woo-to-ne-kau-ske. When late in 1661 the sage Massasoit died, Alexander became grand sachem of the Pokanoket league. Now the long reign of Massasoit had been broken. With him out of the way, certain hearts, jealous of the Wampanoags and their alliance with the English, began to stir up trouble for the new sachem. They reported him as planning a revolt against Plymouth Colony. There may have been some truth in this. The Puritans were a stern, strict people, who kept what they had seized, and who constantly added more. To them the Indians were heathens and inferiors; not free allies, but subjects of the king of England. Before the landing of the Pilgrims in the Indians' territory, sailing ships, touching at the New England shore, had borne Indians away into slavery. Since the landing of the Pilgrims, the Pequots had been crushed in battle, and Captain Miles Standish had applied knife and rope to other Indians. So some doubts as to the wisdom of Massasoit's treaty with the English began to spread through the Pokanokets. The Plymouth officers ordered Alexander to appear at court and answer the charges against him. When he delayed, Major Josiah Winslow was sent to get him. The major took ten armed men, and proceeded for Mount Hope. On the way he found Alexander and party in a hunting lodge, their guns leaning outside. The major seized the guns. With pistol in hand he demanded that Alexander come with him, or die. Alexander claimed that he was a sachem and free ruler, not a dog. He "fell into a raging passion." He had a proper pride, and a fierce temper. He agreed to go, as a sachem attended by his own followers. The charge against him never was pressed, because his rage and shame at the insult threw him into a fever, from which he soon died. He had reigned only a few months. In this year 1662 Philip or Metacomet took his place as grand sachem of the Pokanokets. The death of his brother grieved him. Wetamoo, the young widow, said that Alexander had been poisoned by his captors, the English. The story counted, and the fate of Alexander was not a pleasant story, to the Pokanokets. Philip (Metacomet) saw trouble ahead. His neighbors the Narragansetts had long been at outs with the English. In his father's reign their old chief Mi-an-to-no-mah had been handed over by the Puritans of Connecticut to Chief Uncas of the Mohegans for execution in the Indian way. The Narragansetts were friendly with the Pokanokets; they rather looked upon Philip as their adopted leader. His lands were rapidly going, the English were rapidly spreading, the Puritan laws and religion were being forced upon him. It was galling that he, a king by his own right, should be made a subject of another king whom he had never seen. The New England colonists could not forget how the Virginia colonists had been surprised and killed by the Powatans. They watched King Philip (Metacomet) closely. In 1671 he was said to be complaining that certain of them were trespassing on his hunting grounds. This led to the report that his people were holding councils, and were repairing their guns and sharpening their hatchets, as if for war. So King Philip, like his brother King Alexander, was summoned to the Puritan court, to be examined. He had not forgotten the treatment of Alexander. He went, but he filled half the town meeting-house with his armed warriors. There he denied that war was planned against the English. He was persuaded to sign a paper which admitted his guilt and bound him to deliver up all his guns. He decided not to do this latter thing. To give up his guns would leave him bare to all enemies. He was made to sign other papers, until little by little the Pokanokets seemed to have surrendered their rights, except their guns. The white people, and not Philip (Metacomet), ruled them. Then, in the first half of 1675 the affair of John Sassamon occurred. John Sassamon was an educated Indian who had returned to the Wampanoags, after preaching. He spoke English, and was used by King Philip (Metacomet) at Mount Hope as secretary. He thought that he had found out war plans, and he carried the secrets to Plymouth. The Indian law declared that he should die. In March his body was discovered under the ice of a pond of Plymouth Colony. His neck had been broken. To the Pokanoket idea, this had been legal execution ordered by the sachem. The English called it a murder. They arrested three of King Philip's men. These were tried in court before a jury of twelve colonists and five Indians. They were found guilty. Two were hanged, the third was shot. That was the end of peace. Miantonomah of the Narragansetts had been handed over by the colonists to the law of the Mohegans, but when the Pokanokets tried a similar law against a traitor, they had been punished. King Philip could no longer hold back his young men. He had been working hard, in secret, to enlist all the New England tribes in a league greater than the league of Opechancanough, and by one stroke clean New Eng land of the white colonists. The time set was the next year, 1676. The Narragansetts had promised then to have ready four thousand warriors. But when the word from the English court was carried to Pokanoket, that the three prisoners were to be killed, and that Philip himself was likely to be tried, the warriors of the Wampanoags broke their promise to wait. They danced defiantly. They openly sharpened their knives and hatchets upon the stone window-sills of settlers' houses, and made sport of the English. A sudden cold fear spread through New England. A blood-red cloud seemed to be hovering over. Signs were seen in the sky—a great Indian bow, a great Indian scalp, racing horsemen; a battle was heard, with boom of cannon and rattle of muskets and whistling of bullets. The pious Puritans ordered a fast day, for public prayer, in the hope that God would stay the threatened scourge. Upon that very day, June 24, 1675, the war burst into flame. At the town of Swansea, Massachusetts, near the Rhode Island border, and the nearest settlement to Mount Hope, a Wampanoag was wounded by an angered colonist. The Indians were glad. They believed that the party whose blood was shed first would be victors. The colonists returning from town meeting were fired upon; that day seven were killed and several wounded. King Philip's young men had acted without orders. When King Philip (Metacomet) heard, he wept. He was not yet ready for the war, but now he had to fight. He had at hand sixty Wampanoag men of fighting age; all the Pokanoket league numbered six hundred warriors. Against these could be mustered thousands of the colonists, whose ninety towns extended through Massachusetts, and Connecticut, and into present Rhode Island. Therefore he must act swiftly, or his cause was lost. All depended upon his appeal to the inland tribes on the north. The powerful Narragansetts, his neighbors on the west, were not prepared, and sent no warriors at once; but certain of the other tribes did respond with gun and hatchet and fire. Before the colonists could rally under a skillful leader, the forces of King Philip (Metacomet) were successful. He had plenty of guns and ammunition. Town after town in Plymouth Colony of southeastern Massachusetts was laid in ashes by fierce surprise attacks. The scene shifted to western Massachusetts. The Nipmucks of the Connecticut River, there, aided in the dreadful work. Throughout the summer and fall of 1675 all settled Massachusetts rang with the war-whoops of the Pokanokets and their allies. King Philip (Metacomet) proved himself a master in Indian warfare to strike, and run, and strike again. In this one brief space he earned his title, the Terror of New England, not only because of his first successes, but also because during the span of more than a year no Englishman recognized his voice in battle, and only once was his face seen by his enemies. Long after the war his name was used for frightening children. "King Philip is coming!" And the naughtiest child would quiet and seek his mother's skirt. Although tortures and brutal killings were committed, King Philip himself opposed this. Many stories are told of his kindness to captives, He showed fully as much mercy as the colonists did. Some tribes had failed to help. The Moliegans under Uncas enlisted with the English, which was expected. The "praying Indians," as the Christianized Pokanokets were known, also either stayed aloof, or else were used as scouts against their people. The New Hampshire Indians refused to take up the hatchet, and the Narragansetts still hung back. King Philip's own home of Pokanoket or Mount Hope had of course early been seized by the English troops. They had planned to keep him from escaping to the mainland in the north. But he easily moved his men out, by way of the narrow neck that connected with the mainland. Now he was a roamer, until in this winter of 1675, he decided to stay among the Narragansetts, in southern Rhode Island, and renew his league. To compel the Narragansetts to deliver over the King Philip people, an army of fifteen hundred was raised by Massachusetts, Plymouth and Connecticut colonies. South Rhode Island was then an Indian wilderness, heavily timbered and deep with swamps. Near present South Kingston, in the Narragansett country, upon a, meadow upland amidst a dense swamp Philip had built a fort containing five hundred wigwams. He had built well. The only entrance from the swamp was defended by a high log fence or series of palisades. In addition, around a space of five acres he had laid a thick hedge of felled trees. A single log bridged the water separating the fort from the drier land beyond. The wigwams were made bullet-proof by great stores of supplies piled against their walls, inside. It was reported that he had three thousand persons in the fort—these being his Pokanokets, and many Narragansett men, women and children. The place was called Sunke-Squaw. Treachery it was that broke the power of King Philip (Metacomet). An. 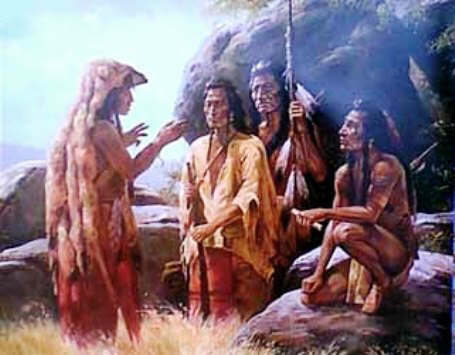 Indian named Peter sought the English and offered to show them how to get in. After a long march amidst bitter cold and driving snow, they arrived at one o'clock in the afternoon of December 19. They were short of provisions, and very weary. For a time matters went ill with them. Again and again their attacking parties were swept from the single log that Peter the traitor had showed to them. A number of officers and men had fallen, before, pressing hard, with night at hand, a party succeeded in entering the fort. Here the hot fight passed from wigwam to wigwam. Some of the English were killed by balls from their own soldiers. Through all the swamp the battle raged. "They run, they run!" sounded the loud cries, from the English within the fort. Their comrades on the outside hastened—scrambling, wading, straddling the log or knee-deep in the half frozen mire. 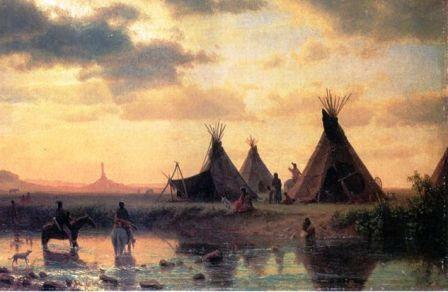 Indian women and children and warriors had taken refuge in the wigwams. Torches were applied, burning them or driving them out to be shot down. Officers tried to prevent the burning of the wigwams, in order to save the provisions, but the fire spread. So by night the fort was in ruins. The Indians were killed, captured or fleeing. Seven hundred had been killed by bullet and sword, three hundred more perished by cold and hunger and wounds; how many old men, women and children had burned to death, no one knew. But a third of the Narragansett nation had been slain or taken captive, and of the Pokanokets only a remnant was left. Eighty killed, was the report of the Connecticut troops alone. There were one hundred and fifty men grievously wounded. As the soldiers had destroyed the fort and its provisions, they had no shelter. Through a furious snowstorm they made a miserable night march of eighteen miles before even the wounded could be attended to. King Philip (Metacomet) was now a fugitive, but he was by no means done fighting. He removed to the interior of Massachusetts—it is said that he traveled clear to the Mohawks of New York, and asked their aid in this war against the English. He did not get it. From January on into the summer of 1676 the war-whoop, the gun-shot and the torch again terrified the colonies. Aided by a few allies, King Philip was making his last great effort. He carried the war to within twenty miles of Boston. Of ninety towns in New England, thirteen had been burned; six hundred buildings had been leveled in smoke, and six hundred arms-bearing colonists killed. "These were the most distressing days that New England ever beheld," reads a record. "All was fear and consternation. Few there were, who were not in mourning for some near kindred, and nothing but horror stared them in the face." Presently Captain Benjamin Church, as noted in New England as Kit Carson is in the West, was upon the sachem's trail. He was a skilled Indian-fighter; he knew King Philip's haunts, and all the Indian ways. There was no let-up by Captain Church. Some captives he turned into scouts, so that they helped him against their former chief; the more dangerous he shot or hanged. To the English notion, these hostile Indians were rebels against the government and deserved no mercy. Other captives, especially women and children, were sent to the West Indies as slaves. Soon King Philip's allies began to desert him. They saw no hope of lasting victory; they accused King Philip of persuading them into a useless war, and either scattered or went over to the English. Among the deserters was Queen Awashonks, squaw sachem of the Sogkonate tribe of the Pokanoket league. Her country lay in the southeast corner of Rhode Island. When Philip had heard that the Sog-ko-nates were helping Captain Church to trail him down, he is said to have smiled never again. Chief Canonchet, great leader of the Narragansetts, was captured and executed. Thus another nail was driven into King Philip's fate. Of Queen Wetamoo's three hundred warriors, twenty-six remained; they were betrayed by one of their own number, and captured, and Wetamoo was drowned in flight. These deaths saddened Philip, but the many desertions blackened his horizon and he knew that he was doomed. By midsummer he was fleeing from spot to spot, with Captain. Church hard after. He had only a handful of Pokanokets and scarcely more Narragansetts with him. Although frequently attacking, he himself was never sighted. The English accused him of hiding in cowardly fashion, but he well knew that with his death or capture the war would be ended. Only the name King Philip supported it still. Toward, the close of July he had been forced south, to his own Wampanoag country of Mount Hope and Pocasset. In a sally north into southern Massachusetts he was surprised, on Sunday, July 30, and his uncle killed and his sister taken prisoner. The next morning there came in haste from Plymouth the doughty Captain Church, aided by Queen Awashonks's men. Where a tree had been felled for a bridge of escape across the Taunton River thirty miles south of Boston, he espied, on the opposite bank, an Indian sitting alone upon a stump. The captain aimed and would have fired, but his Indian companion said: "No. I think him one of our own men." The Indian upon the stump slowly turned his head; the captain saw that he was King Philip with his hair cut short. At the fall of the gun hammer King Philip leaped from the stump, and plunging down a steep bank, was gone. Captain Church crossed the river in pursuit, but did not catch him. The next day he came upon the beaten sachem's forlorn camp. There he captured Philip's wife, Woo-tone-kau-ske, and their little boy of nine years. The end of King Philip (Metacomet) was very near. His relatives, even his sister-in-law, Wetamoo, had died; his friends had deserted him; his remaining family were in the hands of his enemies. "You now have made Philip ready to die, for you have made him as poor and miserable as he used to make the English," Captain Church's Indian scouts praised. "You have now killed or taken all his relations. This bout has almost broken his heart, and you will soon have his head." The head of King Philip was indeed the prize. His escape north was barred by a "great English army"; his flight southward into Rhode Island was limited by the sea. His "kenneling places" (as they were styled perhaps because of the dog's life that he was leading) were constantly betrayed, and his force of true-hearts was melting like the snows. But he received no offer of mercy. None was sent, and he asked for none. He doubled and twisted in vain, and tried an ambush. Captain Church easily side-stepped this; and with only thirty English and twenty Indian scouts, in two days killed or captured one hundred and seventy-three more of the Philip people. Assuredly, King Philip (Metacomet) was growing weak. He might have listened to terms, but in those stern days terms were not made with rebels, especially with troublesome Indians who were assumed to be children of Satan. Captain Church, urged on by the Plymouth government, closed in farther. Now died two of King Philip's remaining captains. Sam Barrow, "as noted a rogue as any among the enemy," was captured, and sentenced at once to death, by Captain Church. He was an old man, but a hatchet was sunk into his head. Chief Totoson, with his eight-year boy and old wife, escaped and reached Agawom, his former home. His little son fell sick; his own heart "became a stone within him, and he died." His old wife threw some brush and leaves over his body, and soon she, also, died. Thus was the Totoson family disposed of. Only old Annawan, Philip's greatest captain, was left with him. They two, and their miserable band of men, women and children, sought last refuge at the abandoned Mount Hope. Here they were, back again, defeated, with nowhere else to turn. On the morning of August 10 Captain Church was home, also, visiting his wife. He lived on the island of Rhode Island, in Narragansett Bay and separated by only a narrow strait from Mount Hope, on the north. There he had word, in much haste, that one of King Philip's men was waiting, to guide him to a swamp where the sachem might be killed. The name of the King Philip man was Alderman, in English. His brother had proposed to King Philip that they all surrender, and King Philip had struck him dead. So revenge burned in Alderman's heart, and he turned traitor. He was of the Queen Wetamoo people, but had deserted her, also. Upon getting word of King Philip's whereabouts, so near at hand, Captain Church kissed his wife good-by, and gladly mounted his horse again—hoping, he said, "by tomorrow morning to have the rogue's head." This night Alderman guided the captain's force truly. They had not far to go—only a dozen or so miles up the Mount Hope peninsula, to the narrow neck. The captain was well acquainted with the exact spot: a little isle of dry land in the midst of the swamp. On the morning of August 12 he had his men arranged silently. Captain Golding was given the "honor of beating up Philip's headquarters." With a picked party, crawling on their bellies, he entered, to surprise the little isle, and drive out the game. Throughout the swamp the other men were placed, two (a white man and an Indian) by two, behind trees, "that none might pass undiscovered." When the enemy should be started in flight, then all the attacking party were to make a great noise. Every figure moving without noise was to be fired upon by the ambuscade. There were not quite enough men to complete the circle of the ambuscade. However, Captain Church took his aide, Major Sanford, by the hand, and said: "Sir, I have so placed the men that it is scarce possible Philip should escape them." There was no thought of sparing King Philip's life, He was an outlaw. Just as the captain finished his hopeful speech, a gun-shot echoed through the misty gray. Captain Golding's men had come upon one Indian, and had fired, and then had poured a volley into the sleeping camp. Again from the harried band rose the cry "Awannux! Awannux! (English! English!)" and into the swamp they plunged. Caleb Cook and Alderman the guide had been stationed together behind a tree. At the first gun-shot, says the Captain Church story, King Philip "threw his petunk (shot pouch) and powder-horn over his head, catched up his gun, and ran as fast as he could scamper, without any more clothes than his small-breeches and stockings." And here he came, directly for the tree. The two behind it let him come "fair within shot." Then Caleb took the first fire upon him. But the gun only flashed in the pan. He bade the Indian fire away, and Alderman did so true to purpose; sent one musket bullet through King Philip's heart, and another not above two inches from it. The gun had been loaded with two balls. King Philip "fell upon his face in the mud and the water, with his gun under him." He was dead, at last, on the soil of his long-time home land from which he had sallied to do battle in vain. "By this time," reads the Captain Church story, "the enemy perceived that they were waylaid on the east side of the swamp, and tacked short about. One of the enemy, who seemed to be a great, surly old fellow, hallooed with a loud voice, and often called out, 'I-oo-tash, I-oo-tash.' Captain Church called to his Indian, Peter, and asked him who that was that called so? He answered, that it was old Annawan, Philip's great captain, calling on his soldiers to stand to it and fight stoutly. Now the enemy finding that place of the swamp which was not ambushed, many of them made their escape in the English tracks." When the pursuit had quit, Captain Church let his men know that King Philip had been killed, and they gave three cheers. Then the captain ordered the body to be pulled out of the mud. So some of the Indians "took hold of him by his stockings, and some by his small breeches (being otherwise naked) and drew him through the mud to the upland; and a doleful, great, naked, dirty beast he looked like," according to their opinion. "Forasmuch as you have caused many an Englishman's body to be unburied, and to rot above ground, not one of your bones shall be buried," pronounced Captain Church. And he ordered an old Indian, who acted as executioner, to behead and quarter King Philip (Metacomet). But before he struck with the hatchet, the old Indian also made a little speech, to the body. "You have been a very great man," he said, "and have made many a man afraid of you; but so big as you are, I will now chop you up." King Philip was known not only by his face, but by a mangled hand in which a pistol had burst. His head and his crippled hand were awarded to Alderman, who had betrayed him; Alderman was told to exhibit them through New England, if he wished, as a traveling show. He gained many shillings in fees. The four quarters of King Philip were hung to the branches of a tree. The head was stuck upon a gibbet at Plymouth for twenty years. The hand was kept at Boston. Caleb Cook traded with Alderman for King Philip's gun; and King Philip's wife and little boy were sold as slaves in the West Indies. Now the Terror of New England had been subdued. He had been leading such a sorry life, of late, that no doubt he was glad to be done, and to have fallen in his stride and not in chains. His age is not stated. Thus peace came to the colony of Plymouth in Massachusetts, and King Philip (Metacomet) had few left to mourn for him, until, after a season, even some of the English writers, their spirit softened, began to grant that he might have been as much a patriot as a traitor. In another century, the colonists themselves rebelled against a government which they did not like. The Native American Indian Story of Metacomet provides an opportunity to read about the life and times of Native American Indians and many of their great chiefs and famous leaders. A Classic Short story about Metacomet for kids and children of all ages. This short story of Metacomet is great to read to kids and children at bedtime. This very short story contains folklore about the famous people of Native Indian tribes. This short Native American story has been selected to keep the attention of kids and children of all ages. Many of the traditional stories featured in this section are true and others are folk stories or myths and legends. Read our free short story online about Metacomet. Read a free, online short story about the people of famous tribes Native American Indians to increase knowledge and understanding of the indigenous people of North America. The Story of Metacomet. Discover the vast selection of pictures which relate to the Stories, History and Culture of Native Americans. The pictures show the clothing, War Paint, weapons and decorations of various Native Indian tribes that can be used as a really useful educational history resource for kids and children of all ages. We have included pictures and videos to accompany the main topic of this section - The Native American story of Metacomet. The videos on this website enable fast access to the images, paintings and pictures together with information and many historical facts. All of the articles and pages can be accessed via the Native Indian Tribes Index - a great educational resource for kids.